A few weeks ago we sat down to a delicious luncheon with friends to celebrate our love of local food from this beautiful region we call home. Read on as our co-founder Victoria shares more about the event and Terase from Taste Byron Bay shares a recipe below... I love food. I love growing food. I love picking food. I love foraging for food. I have been known to stop the car on the side of the road just-to-see-what-is-that-GUAVAS! !-stop-the-car kind of love for food. Emma and I love sharing a meal, with friends is even better. So when Terase from Taste Byron Bay invited us for lunch with friends it was a no brainer! 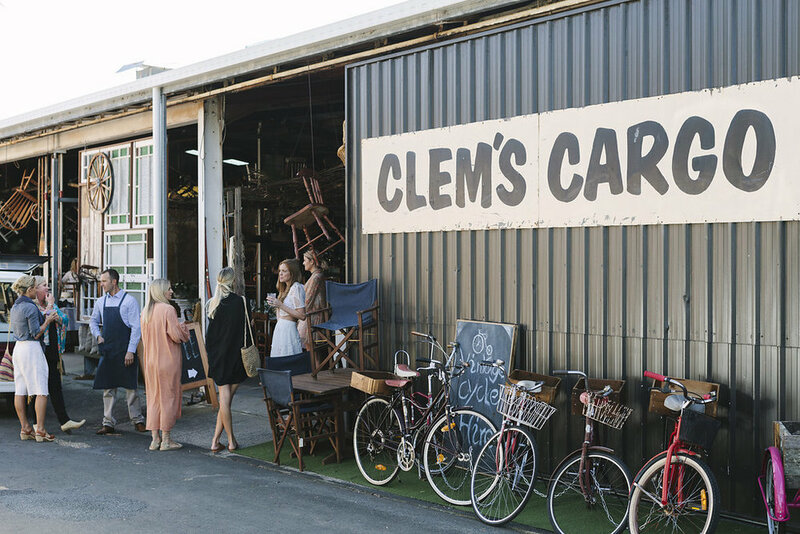 We ventured just down the road and had a delicious long table lunch at Clem’s Cargo. Terase runs food tours in and around Byron Bay, but gosh golly she does more than just that! Taste Byron Bay offers food tours and cooking classes showcasing local produce and supporting local businesses. The shopping food tour is a favourite of ours, with visits to Newrybar Merchants, Brunswick Heads and Bangalow. The shopping food tour showcases local design, talent and amazing local produce! We have included one of the delicious dishes we feasted on at the luncheon. Enjoy!! ï If you don’t feel confident turning the tart upside down onto a serving plate – don’t worry! Simply keep the tart in the pie dish and serve at the table in the pie dish ï If you not a fan of goats cheese, ricotta also works perfectly well with the flavours in this dish ï I often take this dish to friends houses or picnics as it is glorious served at room temperature – for picnics I simply serve it in the pie dish for ease ï Soft brown sugar is best for this recipe – it not only gives you the right flavour balance with the balsamic but it also adds a lovely glossy finish ï You can keep any left over cooked onions in a glass jar in the fridge for a couple of months – they are also great for adding to cheese platters or dolloping on sausages and mash heavenly! ï I often use the leftover beetroot for making a cumin and beetroot dip :: simply add any remaining beetroot to a blender with some yoghurt, ground cumin, salt and pepper – Yep it really is that easy!